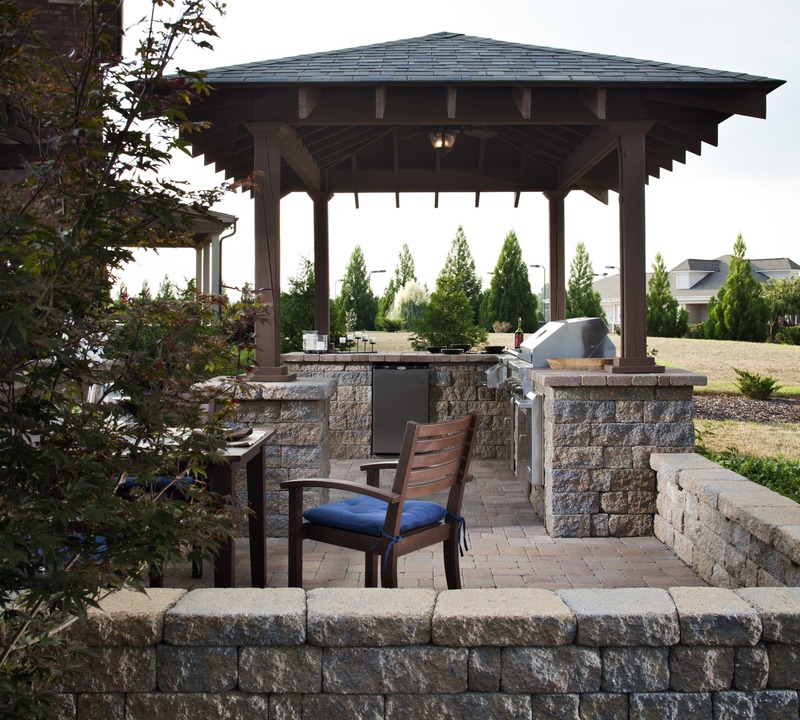 If you are in the process of designing a new paving stone patio or adding an outdoor kitchen to an existing space, here are 15 recommended features you should consider. 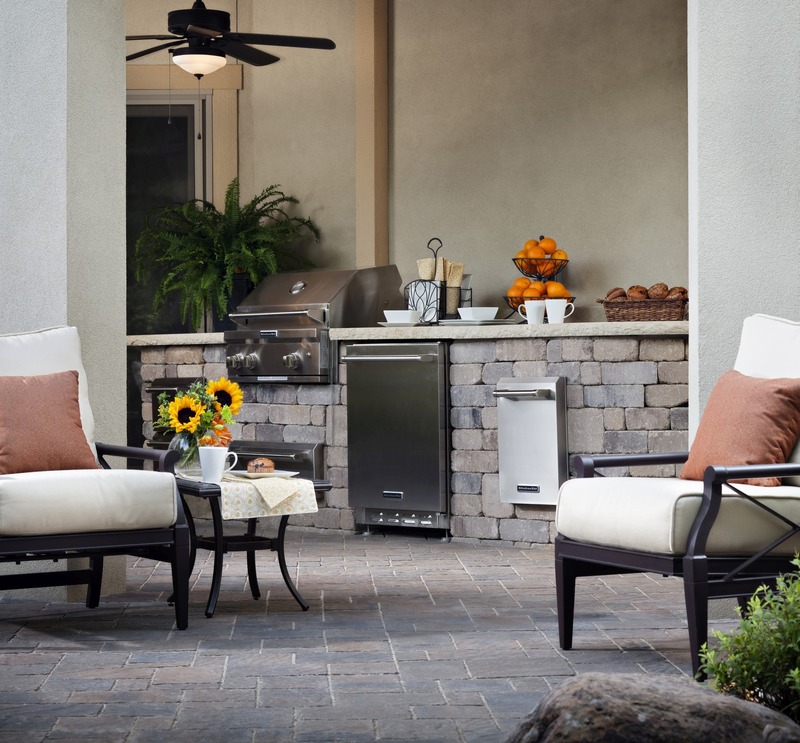 Installing some or all of these patio ideas can make hosting parties much more convenient and can enhance your outdoor cooking experience while helping you avoid running back and forth to your indoor kitchen. Keep in mind that even if your current budget does not allow you to install as many of these features as you would like, you should still include running any necessary electrical, plumbing and drains in the design process, since these things are much easier to put in when you initially install your patio or are replacing it. For some, a refrigerator is an obvious addition to any outdoor kitchen, but some may be focused more on an amazing grill or a handy sink. If you are creating even a small outdoor cooking area, you can certainly find room for a refrigerator, and this is the type of feature you will likely regret not installing if you use the space for something else. An outdoor fridge is perfect for keeping salads cold while you grill the meat, storing beverages for a party or keeping condiments close at hand. This one is listed first because, aside from a grill, it really should be at the top of your list of features to consider. If you entertain often or simply find the walk to your indoor kitchen much too long, you should definitely consider adding an ice maker to your patio kitchen design. It is the perfect addition to compliment a built-in refrigerator filled with your favorite beverages. While this one is not necessarily a must have since you can bring ice from inside or purchase ice for your party, it is definitely a nice addition that will make entertaining more convenient and is sure to impress your guests. There are lots of options available when it comes to outdoor ice makers, including under counter units, free-standing options, and portable, countertop ice makers. Ice makers can be surprisingly affordable with options starting at less than $200 and going up to well over $1,000. 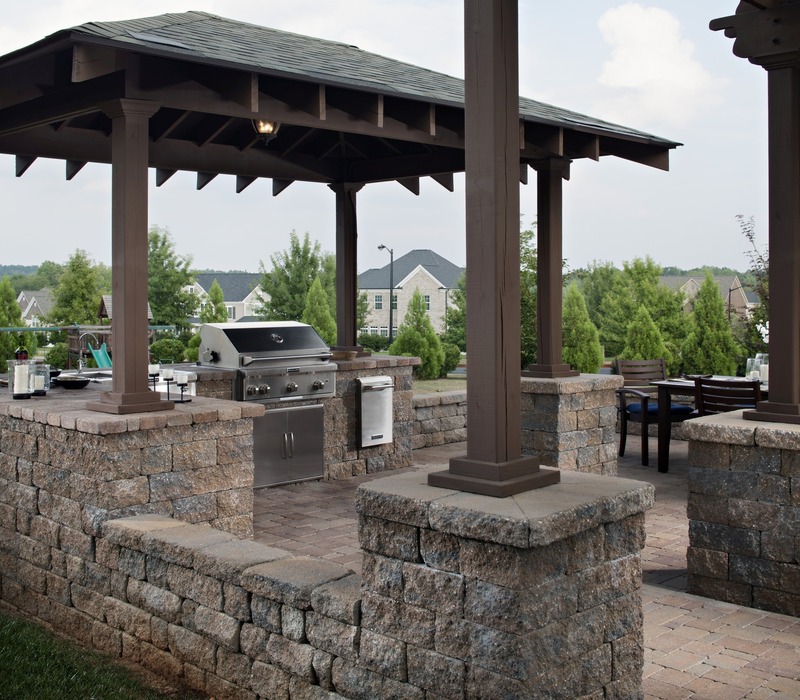 With so many options and such a broad price range, this outdoor kitchen feature can fit into just about any patio design or remodeling budget. Frequent entertainers may find that a wine refrigerator or canned beverage refrigerator is a must-have appliance. You may find that this type of refrigerator will serve your purpose better than a conventional outdoor refrigerator, or you may find that your party-hosting needs can best be met by installing both. It mostly depends on how you plan to use your outdoor fridge. If you think you will use it for storing condiments or keeping food cold during your party, then a conventional fridge is the way to go. If you would rather have a refrigerator that can hold enough bottles of wine to serve your party throughout the night or more than 100 cans of soda or beer to serve your guests, then a beverage refrigerator will better suit your needs. If you are not quite sure you need two refrigerators or prefer the old-school idea of a tub of ice filled with beer, water and soda, then you might want to opt for a built-in cold beverage bin instead of a beverage refrigerator. This budget-friendly option will conveniently hold beverages for your guests during your next weekend get-together and is the perfect choice for a casual outdoor living area. A beer dispenser — sometimes also called a kegerator — is an absolute must have for some party hosts and not at all necessary for others. This one depends entirely on how you plan to use your outdoor living area and the types of gatherings you envision having there. If this is going to be the outdoor equivalent of a man cave, a draft beer dispenser is probably a must. If you plan on hosting frequent social gatherings where a lot of beer is served, opting for kegs is actually better for the environment and for your wallet. Serving beer on tap to your guests means fewer cans and bottles to clean up after the party as well. While we are on the topic of adult beverages, we might as well consider installing a full bar. 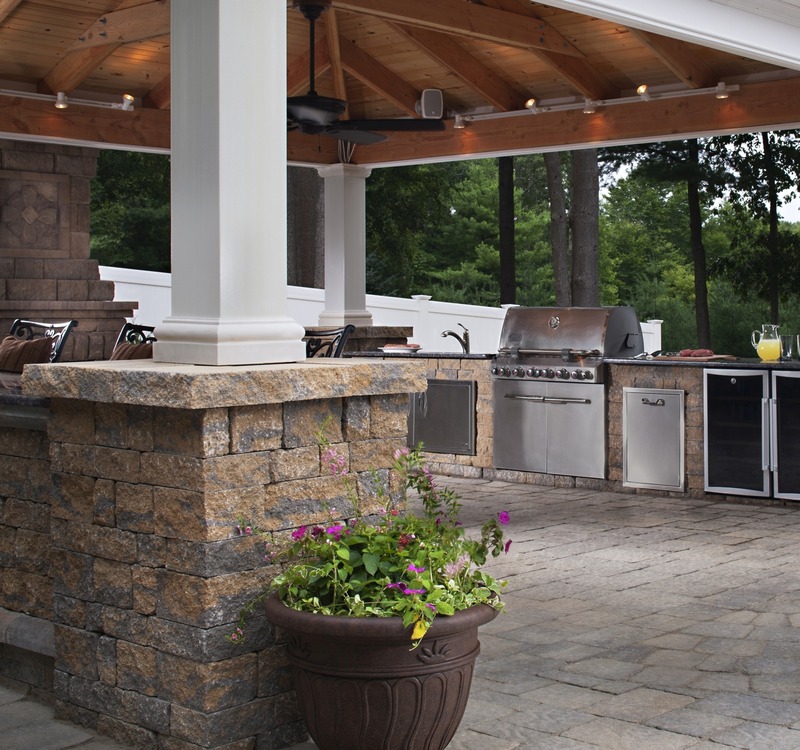 If you enjoy a mixed drink on your patio when you come home at night or are known for your Manhattans or margaritas when you throw a soiree, then a full bar may be in order for your outdoor kitchen. Just think how convenient it would be to have a well for liquor bottles instead of having them cluttering your countertop or how nice it would be to install a bottle opener with a bottle cap catcher to avoid bottle caps all over your yard. If your parties — or evenings with your family — involve mixing drinks, you might consider installing a patio bar to make it easy and convenient to craft cocktails while you entertain. There is more than one reason to consider a double grill. One reason to consider it is that there are many options on the market that have a charcoal grill on one side and a gas grill on the other. This allows grilling enthusiasts to enjoy the best of both worlds without having to purchase two grills. Another reason to consider a two-sided grill is so that you can have one side for grilling meats and one side for grilling bread, vegetables, and other non-meat items. This one is particularly important for people who have vegetarians or vegans in the family or for those who might have vegan guests at their parties. Some folks who strictly avoid meat also avoid foods cooked on surfaces where meat is cooked, so you can better accommodate this growing group of potential party guests by having a grill just for veggies. A warming drawer is a luxury that few us even have in our indoor kitchens, but they are becoming more popular and kitchen remodels now often include this coveted feature. For a patio kitchen, this handy feature allows you to keep burgers and hot dogs warm when cooking large quantities, keep foods prepared indoors warm while you are grilling the rest of the meal, warm up bread rolls or simply keep food warm for guests who show up fashionably late. You can even use a warming oven as a slow cooker for meats and other dishes. This is a really versatile addition that will make your patio kitchen more functional and make outdoor cooking more convenient. 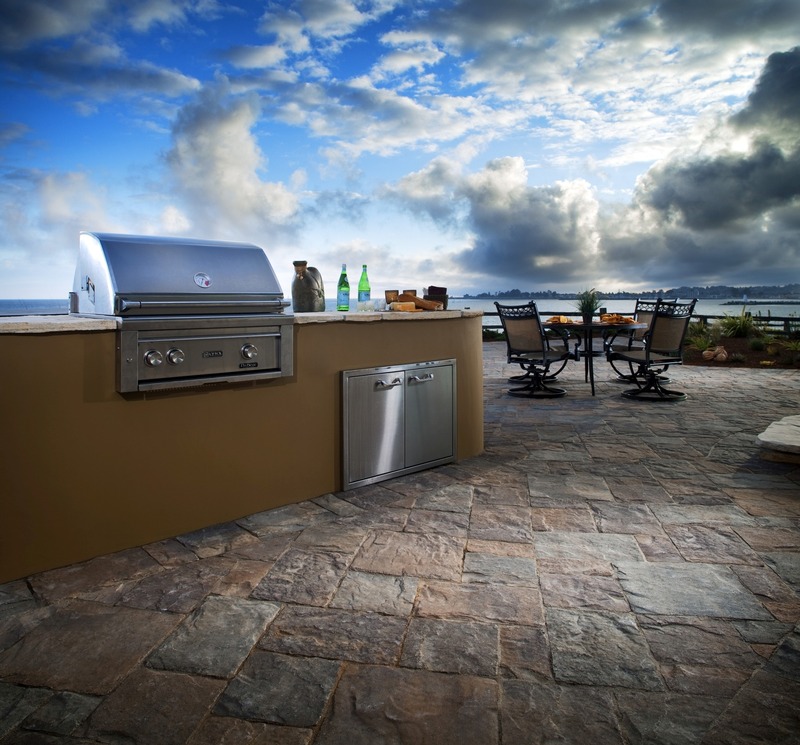 A barbecue grill is an obvious choice for any outdoor kitchen, but if you plan on doing much outdoor cooking, side burners are really a must as well. Side burners are so handy that many portable grills come with one or two now, and they are commonly seen in larger or more upscale patio kitchens. Installing one or two burners, or a full range, expands your patio cooking options and allows you to make a broader range of dishes without having to run back and forth between the stove in your indoor kitchen and the grill in your outdoor kitchen. If you have space, a pizza oven is a fun addition to your outdoor kitchen and brings a whole new meaning to family pizza night. Portable pizza ovens on carts and portable, countertop ovens are available for folks on a tighter budget or limited space, but a built-in, wood-fired pizza oven is a coveted outdoor kitchen feature that will impress guests and really take your patio kitchen to a different level. Remember, pizza ovens are good for cooking more than just traditional pizzas. You can also roast meats, bake bread, cook calzones or grill seafood. As any pit master knows, a smoker is one outdoor kitchen feature that can completely transform your al fresco cooking. Most folks know that smokers bring delicious flavors to meats, but you can also smoke lots of other foods. This includes scallops, olives, cheeses, nuts, and a variety of vegetables and fruits. If you want to up your grilling game and bring new flavors to old favorites, consider adding a smoker to your patio kitchen design. A blender is a necessity for anyone who enjoys a good margarita are entertains often. You can opt for a portable blender that you bring out only when it is time to make beverages or you can install a built-in blender in your counter top when designing your al fresco kitchen. At a minimum, make sure you at least include electrical outlets so that you can bring small appliances, like blenders, outdoors when necessary. A good blender can make much more than margaritas; you can also make fresh salsas, smoothies, and even hot soups to enjoy with your family or serve to your guests. Most outdoor kitchen designs include some type of storage, but this storage is usually in cabinet form. Cabinets are great to have and are necessary for storing kitchen essentials, but drawers come in very handy when it comes to storing smaller necessities. Having at least one of two storage drawers allows you to keep cooking utensils and knives close at hand and can save you from running to your indoor kitchen every time you need a towel or pot holder. If you dine outdoors often, you may want to consider filling your cabinets and drawers with a separate set of dishes and silverware just for your al fresco dining room. You can even keep a separate set of pots and pans outdoors to truly make it a stand-alone kitchen with all of your cooking necessities. A sink is a common feature in outdoor kitchens and is very handy for providing running water to the area. While you can also use your sink to wash the dishes and utensils we mentioned above, you can spend more time with your guests or enjoying your outdoor living area and less time cleaning up if you install an outdoor dishwasher to wash them for you. This is a luxury addition that most folks do not include, but just imagine how convenient it would be to have one and how much it will impress your guests. A garbage disposal is not an absolute must for the sink in your outdoor kitchen, but it can make life easier. This is particularly true if you plan to peel vegetables, wash dishes or rinse dishes to put in your outdoor dishwasher. 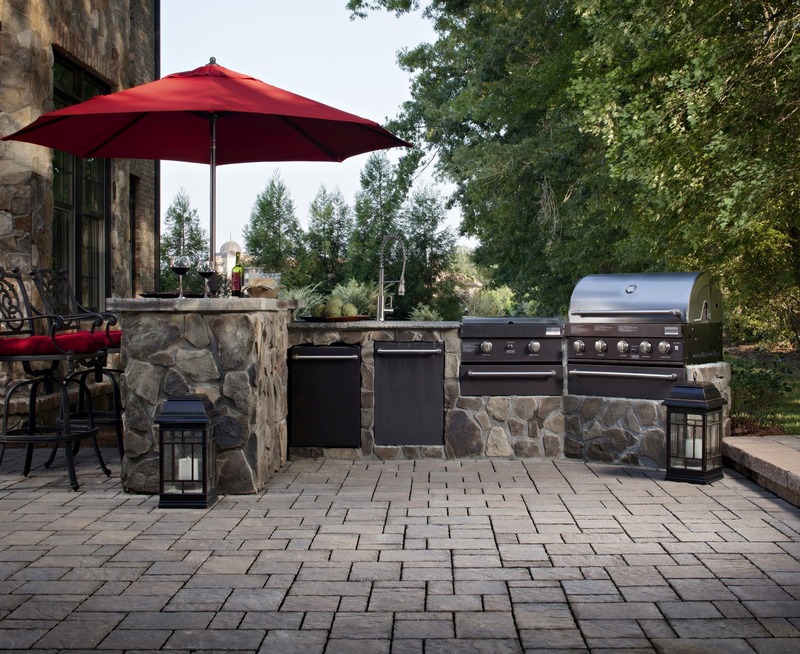 Can I Increase My Home’s Value with an Outdoor Kitchen?